Persistent high risk HPV infection can lead to cervical cancer, the second most common malignant tumor in women worldwide. NK cells play a crucial role against tumors and virus-infected cells through a fine balance between activating and inhibitory receptors. Expression of triggering receptors NKp30, NKp44, NKp46 and NKG2D on NK cells correlates with cytolytic activity against tumor cells, but these receptors have not been studied in cervical cancer and precursor lesions. The aim of the present work was to study NKp30, NKp46, NKG2D, NKp80 and 2B4 expression in NK cells from patients with cervical cancer and precursor lesions, in the context of HPV infection. NKp30, NKp46, NKG2D, NKp80 and 2B4 expression was analyzed by flow cytometry on NK cells from 59 patients with cervical cancer and squamous intraepithelial lesions. NK cell cytotoxicity was evaluated in a 4 hour CFSE/7-AAD flow cytometry assay. HPV types were identified by PCR assays. We report here for the first time that NK cell-activating receptors NKp30 and NKp46 are significantly down-regulated in cervical cancer and high grade squamous intraepithelial lesion (HGSIL) patients. NCRs down-regulation correlated with low cytolytic activity, HPV-16 infection and clinical stage. NKG2D was also down-regulated in cervical cancer patients. Our results suggest that NKp30, NKp46 and NKG2D down-regulation represent an evasion mechanism associated to low NK cell activity, HPV-16 infection and cervical cancer progression. Cervical cancer is the second most common female malignant neoplasm worldwide. Human papillomavirus (HPV) is a necessary but not sufficient cause of cervical cancer. Co-factors that increase the risk for cervical cancer among HPV-DNA positive women, include oral contraceptives, smoking, high parity, previous sexually transmitted disease and immunodeficiency . Cervical carcinogenesis implies HPV infection, viral persistence, progression and invasion . Both innate and adaptive immune responses play a complex role against HPV infection. Spontaneous regression of high grade squamous intraepithelial lesions due to HPV-16 infection is associated with HPV-16 E7 peptide-specific CD4+ T-cell response and with lymphoproliferative responses to E2 plus IFN-gamma production [3–7]. However, innate immune response acts directly or indirectly against viral agents, through TLRs activation, dendritic cell presentation and NK cell function at cervical tissue level [8–11]. NK cells represent the first line of defense against viral pathogens, killing infected cells or via secretion of cytokines and chemokines . There is also accumulating evidence for the crucial role of NK cells in tumor immunosurveillance . NK cell activation and tumor lysis occur through a complex interaction between triggering receptors such as NKp30, NKp44, NKp46 and NKG2D with tumor cell ligands, in fine balance with inhibitory receptors and co-receptors . Recently, it has been reported that activating NK cell receptor ligands MICA (NKG2D ligand) and CD155 (DNAM-1 ligand) are differentially expressed during the progression to cervical cancer . However, the expression of NKp30, NKp46, NKG2D (triggering receptors) and co-receptors (NKp80 and 2B4) in NK cells from patients with cervical cancer and precursor lesions remains unknown. The aim of the present work was to study NKp30, NKp46, NKG2D, NKp80 and 2B4 expression in NK cells from patients with cervical cancer and precursor lesions, in the context of HPV infection. Blood samples were obtained from patients with invasive squamous cervical carcinoma (20), high grade squamous intraepithelial lesions (HGSIL) (20) and low grade squamous intraepithelial lesions (LGSIL) (19). Colposcopy and cytology results were confirmed by histopathology. Two different pathologists independently confirmed the diagnosis for all the specimens. Women without a history of abnormal Pap smears and negative for HPV were included as controls. Demographic, clinical characteristics and epidemiologic data were obtained. All women were attended at OPD Hospital Civil de Guadalajara, Mexico. The protocol was approved by Biomedicine Sciences and Ethic Committees (CSIM 200-22, 20000302032 and 2003, 259-0021), according to the last guidelines of the World Medical Association Declaration of Helsinki. Informed Consent was obtained from all participants enrolled in the study. Peripheral blood mononuclear cells (PBMC) were isolated by gradient Lymphoprep (Oslo Norway Nycomed™). NK cells were obtained by immunomagnetic negative selection (NK cell isolation kit, Miltenyi Biotec) in accordance with the manufacturer's instructions. After immunomagnetic depletion, NK cell CD56+ were >95%, (confirmed by flow cytometry analysis). Cell concentration was adjusted to 1 × 105 and cells were incubated at 4°C for 30 min with proper dilution of anti-NKG2D (ECM217), anti-NKp30 (Z25); anti-NKp46 (BAB281), anti-NKp80 (MA252), or anti-2B4 (PP35) specific antibodies (kindly donated by Professor Alessandro Moretta, University of Genova, Italy). Cells were washed with a phosphate buffered saline (PBS) solution and incubated at 4°C for 30 min (in the dark) with FITC goat anti-mouse secondary Ab (IgG1). The cells were washed twice and incubated with 5 μL of PE-conjugated anti-CD56, PC5-conjugated anti-CD3 mAbs or with control isotype and fixed with 0.05% formaldehyde solution (all reagents from Beckman Coulter). The percentages and Median Fluorescence Intensity (MFI) were determined with a proper protocol and controls to compensate electronically for overlapping signals, using an EPICS XL-MCL flow cytometer (Beckman Coulter™). DNA extraction was done in cervical cells obtained by cytobrush. Pellets containing cervical cells were obtained by centrifugation at 10 000 rpm for 3 min, 200 μg of Proteinase K was added for 48 hours at 37°C. Proteinase K was inactivated at 94°C for 10 minutes. Aqueous supernatant was transferred to another fresh microtube. DNA was precipitated by adding 100% ethanol and 20 mg/mL glycogen (Sigma) for 30 min at 22°C. The pellet was washed twice with 70% ethanol, dried, resuspended in 200 μL distilled water, and measured spectrophotometrically at 260/280 nm. HPV typification was performed using specific primers (Table 1). All PCR reactions were performed in a total volume of 50 mL. PCR mixture contained 75 mM Tris-HCl pH 8.8, 20 mM (NH4)2SO4, 0.01% Tween 20, 2 mM MgCl2, 0.2 mM dNTPs, 0.6 mM of each primer, 1.25 U Taq DNA recombinant polymerase (Fermentas International Inc; Burlington, ON, Canada), and 100 ng DNA. Genomic DNA from SiHa (HPV16) and HeLa (HPV18) cells, tissue samples with known HPV infection for HPV6/11, HPV31, and 33, were used as positive controls. Genomic DNA from C33A cervical carcinoma cells was used as negative control. The cycling protocol for CpI/CPII was 94°C for 30 sec, 51°C for 30 sec, and 72°C for 60 sec for 40 cycles; HPV-16, 92°C for 120 sec, 48°C for 90 sec; HPV-6/11 and HPV-18, 92°C for 120 sec, 48°C for 90 sec, and 72°C for 60 sec for 38 cycles; and HPV-31 and HPV-33, 94°C for 60 sec, 45°C for 60 sec, and 72°C for 60 sec for 45 cycles. Amplification products were electrophoresed on a 1.8% agarose gel and visualized after ethidium bromide staining under UV light. Statistical analysis was performed using the SPSS software package version 10.0 (SPSS, Inc Chicago, IL). Data were expressed as percentage, mean median fluorescence intensity (MFI) and analyzed by ANOVA. Significance was tested by non parametric test (Mann-Whitney U test). Differences were considered statistically significant when the p value was < 0.05. Spearman correlation was done to correlate activating receptors with HPV expression and Pearson correlation to cytotoxic activity. The study enrolled 59 patients and 20 healthy women. Histological analysis confirmed that cervical cancer patients (20 cases) had squamous cell carcinomas (70% non-keratinizing large cell type and 30% keratinizing large cell type). HGSIL (20 cases) and LGSIL (19 cases) diagnoses were also confirmed by histopathology. There was no significant difference in mean age ± SD between cervical cancer patients (51.55 ± 14.55), HGSIL patients (41.29 ± 10.89), LGSIL patients (38.52 ± 9.72) and controls (44.10 ± 9.56). Peripheral blood NK cell percentage was not significantly different between HGSIL, LGSIL and healthy women (mean ± SD = 18.31 ± 2.61, 17.84 ± 2.39 and 14.98 ± 3.41, respectively). However, patients with cervical cancer had significantly lower NK cell percentage (10.47 ± 3.58) in comparison with HGSIL patients (p < 0.05). We analyzed by flow cytometry the NCR (NKp30 and NKp46) phenotype (dull or bright), NKp30, NKp46 and NKG2D-expressing cells and MFI was also evaluated. Most healthy donors (90%) and patients with LGSIL (85%) had NK cells with NKp30Bright and NKp46bright phenotype. Patients with HGSIL had NK cells with NKp30bright and NKp46bright phenotype of 50%. In contrast, only 30% of patients with invasive cervical carcinoma showed NKp30bright and NKp46bright phenotype. We observed a significant decrease in NKp30 and NKp46 MFI on NK cells obtained from cervical cancer patients and HGSIL in comparison with healthy women and LGSIL patients (Figure 1). NKp30 and NKp46 expression (MFI) showed a significant negative correlation with HPV-16 infection (r = -0.508., p = 0.05). We did not find any significant correlation between NKp30 and NKp46 expression and other HPV types infection. Spearman's Correlation Coefficient between stage and NKp30 and NKp46 expression (MFI) showed a significant negative correlation (r = -0.774, p = 0.01). NCRs and NKG2D expression are decreased in NK cells from cervical cancer patients. NKp30, NKp46 and NKG2D expression was analyzed by flow cytometry on NK cells from patients with cervical cancer (20 cases), HGSIL (20 cases), LGSIL (19 cases) and 20 healthy women. MFI was expressed as mean ± SD. A) NKp30; B) NKp46: * HGSIL versus LGSIL and healthy women p < 0.02, ** Invasive Ca versus LGSIL and healthy women p < 0.0001; C) NKG2D: * Invasive Ca versus LGSIL and healthy women p < 0.02; D) Two representative histograms of each group are shown, filled curve: isotype control antibody. We also found a significant lower expression of NKG2D on NK cells from cervical cancer patients in comparison with healthy women (p < 0.05). There was not a significant difference with HGSIL and LGSIL patients (Figure 1). 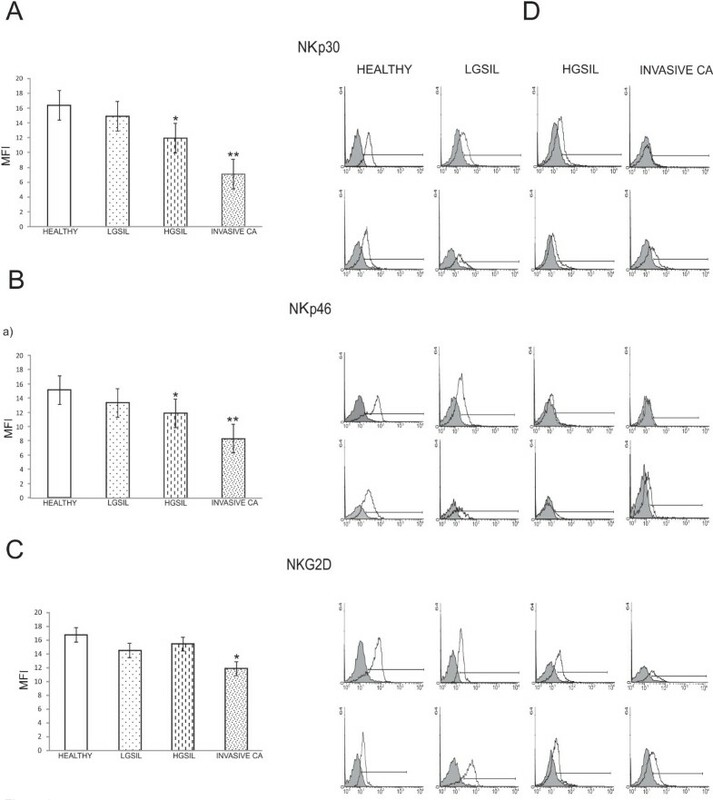 Expression of co-receptors 2B4 and NKp80 (MFI) on NK cells was not significantly different between cervical cancer, HGSIL, LGSIL and healthy groups (Figure 2). 2B4 and NKp80 co-receptor expression is not down-regulated on NK cells from cervical cancer patients. 2B4 and NKp80 expression was analyzed by flow cytometry on NK cells from patients with cervical cancer (20 cases), HGSIL (20 cases), LGSIL (19 cases) and 20 healthy women. MFI was expressed as the mean ± SD. A) 2B4; B) NKp80; and C) Two representative histograms of each group are shown, filled curve: isotype control antibody. NK cell-mediated specific cell lysis was decreased according to the natural history of cervical cancer: healthy women > LGSIL > HGSIL > cervical cancer (Figure 3). NK cell activity was significantly lower in patients with cervical carcinoma at all E/T ratios in comparison with LGSIL patients and healthy women (p < 0.0001). NK cell activity was also significantly decreased in HGSIL patients at 10:1 and 30:1 E/T ratios (p < 0.02) in comparison with LGSIL patients and healthy women (Figure 3). Percentage of specific lysis was correlated with NKp30 and NKp46 MFI. We found a significant correlation with NKp30 at 10:1 ratio (r = 0.686, p < 0.001) and at 30:1 ratio (r = 0.749, p < 0.001). We also found a significant correlation with NKp46 at 10:1 ratio (r = 0.468, p < 0.05) and at 30:1 ratio (r = 0.658, p < 0.01). NK cell specific lysis is decreased according to the natural history of cervical cancer: healthy women (6 controls) > LGSIL (6 cases) > HGSIL (5 cases) > cervical cancer (5 cases). NK cell cytotoxicity against K562 cells was evaluated in a 4 hour CFSE/7-AAD flow cytometry assay against K562 tumor line. Significant difference at 10:1 and 30:1 E:T ratios: Invasive Ca and HGSIL versus healthy women p < 0.0001 and p < 0.002, respectively. It has been proposed that immunosurveillance escape might be the seventh hallmark of cancer . Intricate interactions between tumor and immune cells take place within the tumor microenvironment. These complex processes (often unknown) result in either tumor destruction (elimination phase), equilibrium phase or tumor growth (escape phase) by sculpting immunogenic cancer cells. Experimental and clinical evidence suggests that edition process dictates the immune response within tumor microenvironment. Cervical cancer represents an excellent opportunity to study the immune response and evasion mechanisms from precursor lesions to invasive carcinoma. NK cells play a crucial role in tumor immunosurveillance . Arguments that may point to an important role of NK cells in the natural history of cervical cancer are: a) NK cells can recognize and either destroy virally infected cells or control the infection via cytokines (IFN-gamma and TNF-alpha), b) HPV-associated cervical tumors frequently exhibit a reduction in MHC class I expression as an immune evasion strategy, c) NK cell receptor ligands (MICA and CD155) are differentially expressed during progression to cervical cancer [15, 18, 19]. However, the biological significance of NK cells on HPV infection, viral persistence, SIL progression and invasion has not been addressed. In this article we examined NKp30, NKp46, NKG2D, NKp80 and 2B4 expression in NK cells from patients with cervical cancer and precursor lesions, in the context of NK cell cytolytic activity and HPV infection. We report here for the first time that the NK cell-activating receptors NKp30 and NKp46 are significantly down-regulated in cervical cancer patients and HGSIL. Our results are consistent with previous reports in patients with myelocytic/monocytic acute myeloid leukemia. NK cells from such patients exhibit poor cytolytic functions due to deficient expression of NKp30, NKp44, and NKp46 receptors . Myelodysplastic syndromes have reduced activating NK cell receptors (NKG2D and NKp30) in association with disease progression to myeloid leukemia . It has been reported that NCR expression on NK cells correlates with the ability to lyse tumor cells . NKp30 and NKp46 are the major NCRs against tumors. On the other hand, NK cell-mediated killing of HeLa cells was not significantly reduced with anti-NKp44 as seen with anti-NKp30 . Our findings suggest a clinically relevant role of NCRs in cervical cancer progression, because low NKp30 and NKp46 expressions were correlated with diminished NK cell activity, HPV-16 infection and clinical stage. While the statistical correlation between diminished receptor expression and diminished specific lysis is strong, we cannot rule out the possibility that other mechanisms, such as lowered adhesin binding or decreased perforin B/granzyme activity might be operating in the reduction of specific lysis. To clarify this point, future experiments looking at changes of other molecules might be warranted. It is important to extend our findings using cervical cancer cell lines and fresh cervical cancer cells as targets. NCR ligands are still unknown, but by using soluble NCR fusion proteins the existence of NCR ligands on several tumor cells has been documented. Direct analysis of the expression of NKp30L and NKp40L on Hela cells (a cervical cancer cell line) revealed intracellular and extracellular expression of both ligands, wich was linked to NKp30-dependent lysis . In this study we also found that the NK cell-activating receptor NKG2D is significantly down-regulated in cervical cancer patients. This result is consistent with a previous study reporting a significant decrease in the number of NKG2D-expressing NK and T cells in both cervical cancer and precursor lesion patients. However, they only found a significant correlation between high soluble MICA levels and low NKG2D in T cells . NCRs and NKG2D may be down-regulated by different molecules and mechanisms such as TGF-beta, indoleamine 2,3-dioxygenase, prostaglandin E2, corticosteroids, 17 beta-estradiol and reactive oxygen species [25–29]. We do not know yet the precise mechanism that underlies NKp30, NKp46 and NKG2D down-regulation in NK cells from cervical cancer patients; however, it has been reported that TGF-beta1 mRNA overexpression is associated with progression from LGSIL to HGSIL [30, 31]. TGF-beta is also upregulated at least two-fold in lymph node cervical cancer micrometastases . Indoleamine 2,3-dioxygenase was also found at the invasion front of invasive cervical tumors and peritumoral stromal cells . In the present work we found that NKp30 and NKp46 diminution was linked to HPV-16 infection. HPV-16 oncoproteins E6 and E7 down-modulate IFN-gamma and IL-18 response . Other studies suggest that HPV infection affects dendritic cell migration and function [35, 36]. We recently reported that CEACAM1, an adhesion molecule with NK cell inhibitory properties, is up-regulated in HGSIL linked to HPV-16 infection . Taken together our results and previous reports suggest that NKp30, NKp46 and NKG2D down-regulation represent an evasion mechanism associated with low NK cell activity, HPV-16 infection and cervical cancer progression. Our findings may be important for development of new therapeutic strategies, for example the use of NCR-Ig fusion proteins with aim of inhibit tumor growth . Our results suggest that NKp30, NKp46 and NKG2D down-regulation represent an evasion mechanism associated with low NK cell activity, HPV-16 infection and cervical cancer progression. The authors thank to Rogelio Troyo Sanroman for his assistance with statistic analysis. The authors are also indebted to Jesse Haramati for proofreading of the manuscript. This work was supported by a grant from SIMORELOS-CONACYT (20000, 20000302032) and from The Terry Fox Foundation to A. Daneri-Navarro. TGI: Performed the experimental work described in the study; searched and updated scientific literature and contributed scientific ideas and wrote draft manuscript. ATA: Was the core in the flow cytometry experiments and performed research; participated in the design of the study and reviewed the manuscript. BAS: Contributed to HPV detection and performed research. STA: Contributed in the design of the study; provided scientific ideas and assisted with the writing of the manuscript. PESH, MGRD and ABP contributed with scientific ideas and technical support. ABC and POL: Contributed with scientific ideas and NK cell cytotoxicity assay assistance. ADN: Conceived and designed the study; got the project Grant; coordinated the study; provided valuable scientific suggestions and reviewed, wrote and edited the manuscript (Corresponding Author). All authors read and approved the final manuscript.